Here's the latest episode of "Addictive Fishing" featuring their new BT Vengeance. Capt. Blair catches some nice redfish and also has some interesting things to say about the current state of the lagoon and its algae problem. I'm a little behind schedule with my photos and these were from last weekend when some of my relatives from Delaware were in town. 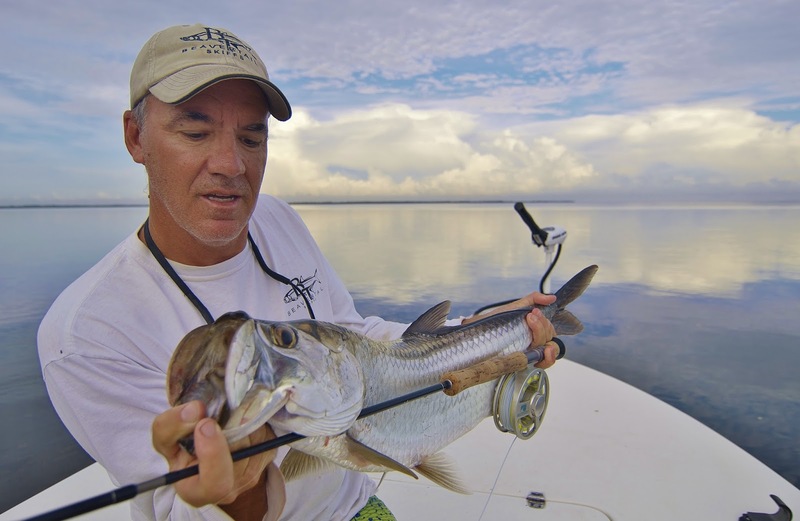 Here's a shot of cousin Jason with his first tarpon, a sweet 30 pounder that ate a pinfish in Matlacha Pass. You can see that the water is still very brown which is not uncommon for this time of year. 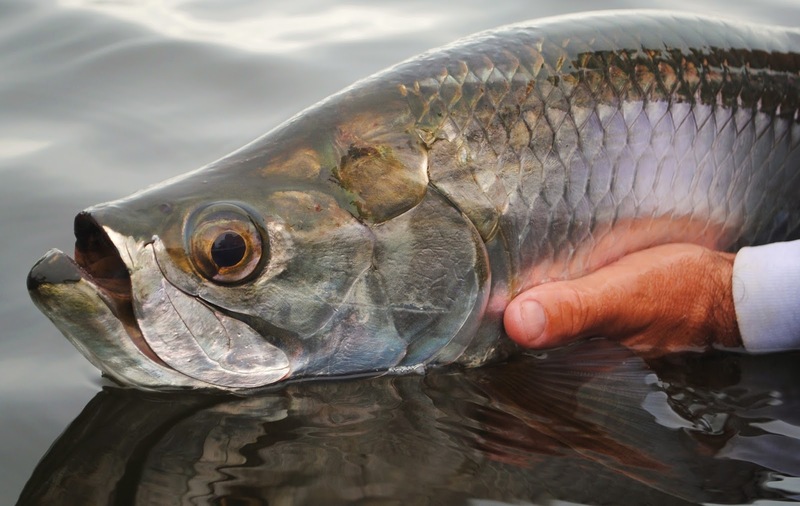 The tarpon don't mind it at all and have been rolling happily most mornings from the mouth of the Caloosahatchee to Burnt Store Marina. This is a shot from yesterday morning after 18-yr old Chance Smink from PA landed his first tarpon. It wasn't a full grown fish but we kept it in the water since it was just over the 40" size limit. This was one of a few dozen tarpon busting live minnows and crabs in the very brown water just north of the Matlacha Pass drawbridge. 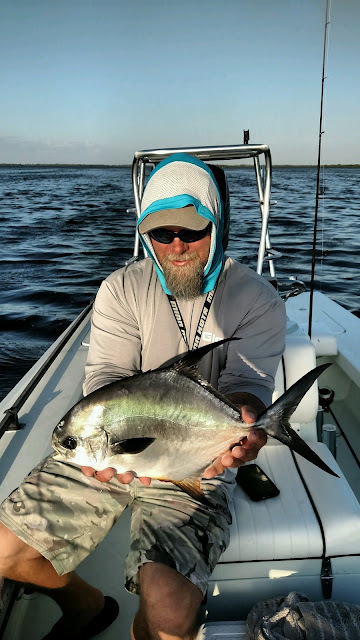 They've been on a feeding frenzy lately and my anglers have been hooking them on everything from live pinfish to #4 Schminnow flies. The white ibis is a very common bird all over Florida. I've seen them in the depths of the Everglades and in my front yard after every rainfall. The one in this photo was interesting since it was at the end of dimorphic color change. They're mostly brown for the first two years of their life and then gradually transition to the solid white during year three. This ibis was almost finished with that change and was also very cooperative as it sat on a mud flat in the Ding Darling refuge last month. I took this picture a few weeks ago from the shoreline just north of the Punta Rassa boat ramp at the south end of Matlacha Pass. This is practically at the mouth of the Caloosahatchee River. Despite what you might be hearing from the media, our water in SW Florida is not a lifeless, brown mess. The snook, trout, redfish and tarpon are still all over the flats of Matlacha and Pine Island despite the releases coming from Lake Okeechobee. Some folks have gotten a bit upset at me for making posts like this but the truth is that my friends and I are still seeing and catching plenty of fish. And NO, I don't think the Lake O releases are harmless, and YES, I voted for Amendment 1 and fully support spending all the money for the Everglades Restoration Plan. Everyone needs to remember that the US government spent the first half of the 20th Century trying to drain the Glades and now that they're trying to reverse it the damage just won't be fixed overnight. But right now, what I'm seeing and really don't like is sensationalism and lazy journalism on this issue. It's summer in SW Florida. We're getting a lot of rain and yes, some of our water is very dark. This happens every year and you'll still catch fish. Here's a shot of my friend and local angler Frank Potter with an excellent redfish he caught on fly yesterday morning. This red was right at the 27" slot limit, as big as we're allowed to keep them in SW Florida. If we were in a tournament, this fish would have been worth some money. We originally set out to go tarpon fishing but a strong easterly breeze and a bunch of high clouds wrecked that for us. Plan B was to hit the creeks and try to find some tailing reds which worked quite nicely. This fish was crawling in less than a foot of water when Frank dropped the fly right on its nose about 30 feet from the boat. The take was violent and immediate, as well as one of the coolest things I've seen from the poling platform in a while. I really need to start using my GoPro like everyone else does.